Southern Florida, particularly the more metropolitan areas such as Miami and Ft. Lauderdale are definitely not known for being quiet areas. The constant honking of horns, people yelling in multiple languages and bold headlines of bizarre news events make South Florida a melting pot of noise. Native tree frogs may be amping up their mating calls to be able to be heard over the invasive Cuban tree frogs that arrived to the state in the 1930s. The Cuban tree frogs likely ended up in Florida as stowaways in shipping crates. Ecologist Jennifer Tennessen, a graduate student at The Pennsylvania State University, and her colleagues recorded the calls of the Cuban tree frog (Osteopilus septentrionalis) to see how they affected two native species of tree frogs: green tree frogs and pine woods tree frogs. Her prediction was right. After playing recordings of the Cuban tree frogs, green tree frogs (who have a call similar to Cuban tree frogs) in Everglades National Park doubled their number of calls per minute. This change did not occur in pine woods tree frogs and researchers predict this is because their call is more easily distinguishable from the others. She also explained that because the green tree frogs are doubling their call rate, predators may find them more easily. 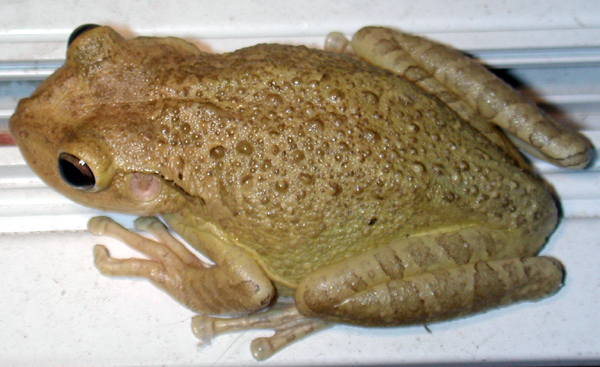 The competing call of the Cuban tree frog could also disrupt the soundscape of other organisms who rely on sound for survival.